In this post, I give a brief and basic example of how to import a file into R and then display it using a C#-based windows GUI. I’ve previously put up an introduction to getting C# and windows-based GUI programs to interact with R using R.NET. My previous example was very, very basic (just a calculator talking to R), so here’s something that’s a little bit more interesting. 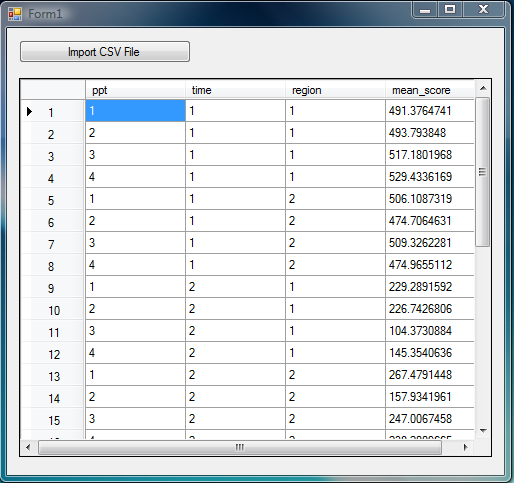 The ‘Import CSV file’ button calls up the function that does the work. To get the basics of this working, see my previous post. I’ll now go through the code step by step, providing snippets and then commenting on them. So, we begin by connecting to the REngine instance. We then send a simple command to R as we would if we wanted to import a CSV file, using the read.table command. The useful thing here is that I’ve used file.choose() which is helpful because it creates the popup dialog window you’d expect from R to help you choose the file to import. Note that I’ve set it here to import a CSV, but of course you could change this to any of the other many formats your data may be in. Once we have chosen our file, we need to get the dataframe back from R so we can then display it in a DataGridView box (here called dataGridView1). To work out how to do that, we just ask oursevles the question: how would we do it using R? We’d just type in the dataframe’s name – which, in this case, is dataset. To send this command to R from R.NET, you just need to use engine.eagerevaluate. This sends the command “dataset” to R running in the background as though we were typing it into the console ourselves. Now, we next need to tell R.NET what to do with the command we’ve just sent it. We’ve asked for a dataframe, so we want to take the result we get from our command and convert it to a dataframe for R.NET to interact with. To do that, we just append AsDataFrame() at the end of the eagerevaluate command. We now have one dataframe in R called dataset, and one in our C# program also called dataset! With our dataframe imported through from R, we can begin by building up our DataGridView box. It’s just a simple case of iterating through the dataframe we’ve created and filling the DataGridView box. R.NET has all the useful ways to interact with a dataframe that you would expect, including getting access to the number of rows and columns, as well as the names of those rows and columns. I begin by setting up the column names using the code above. Next, the rows and their names get added. I think it’s all pretty straightforward so won’t go into detail here. Finally, we fill in the actual values within each cell. So there we go. I’m sure the code could be cleaner, but it works as a basic example! I’m still new to C#, and any comments would be greatly appreciated as always! The next steps will be to begin doing something meaningful with the data that have been imported. To leave a comment for the author, please follow the link and comment on their blog: Psychwire » R.